Appalachian State University won the U.S. Department of Energy Solar Decathlon 2011 People’s Choice Award for its Solar Homestead today. This award gives the public the opportunity to vote for its favorite house. This year, 92,538 votes were cast. 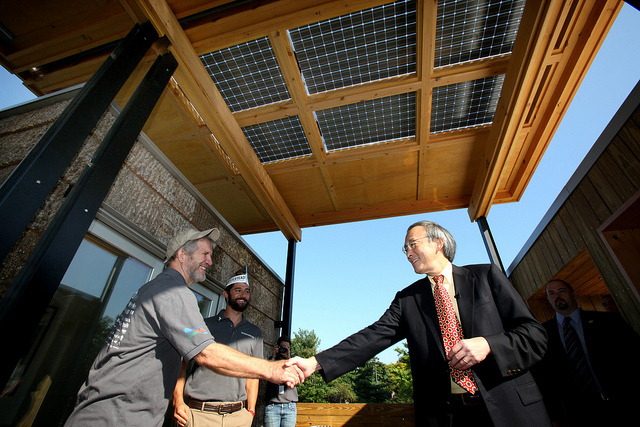 The award was announced at a Victory Reception in the solar Village in West Potomac Park—the last official event of Solar Decathlon 2011. The Solar Homestead is a self-sustaining net zero-energy house inspired by the pioneer spirit of the early settlers to the Blue Ridge Mountains. The isolation of early settlers to the Appalachian region fostered a pioneer spirit in those who established self-sustaining living/working compounds on the frontier. The Solar Homestead fuses these values into a highly energy-efficient home, which remains true to these underlying principles by integrating renewable resources and innovative technology into a prototype that is adaptable, self-sufficient, rugged, affordable, and attractive. As announced earlier this week, Appalachian State also won second place in the Communications Contest and third place in the Architecture Contest. Appalachian State University is located in Boone, North Carolina. This entry was posted on Saturday, October 1st, 2011 at 8:36 pm and is filed under Appalachian State, Competition, Solar Decathlon, Solar Decathlon 2011, Teams.